Whether it's cave drawings from the Stone Age or fine art masterpieces from the Renaissance, mankind has a clear obsession for making things and we're always looking for the next tool to help us. Virtual reality, which has become one of 2016's biggest tech trends, has the potential to transform the creative process greatly. From painting tool Tilt Brush to music-making app SoundStage, there is a new wave of apps and platforms, particularly for high end headsets like HTC's Vive, kicking things off. Creating music doesn't come cheap. Not only do you need the right instruments and recording equipment, but you also need tools for the production process. But VR app SoundStage is changing the cards here. It's a music sandbox built for room-scale virtual reality. Designed specifically for the HTC Vive, the tool has been designed for a range of music creators. For instance, there are production features for professional DJs who want to experiment with new sounds or hobbyists who want to play virtual instruments like drums. It lets you create your own music studio by playing around with drums, speakers and synthesizers. The idea is that it attempts to capture the feel and experience of the music production environment through the power of VR. You're able to create music from the comfort of your home. Logan Olson, the creator of SoundStage, explains that he wanted to get creative with music but struggled to use professional software packages. So he decided to develop his own VR app as a solution. "I wanted to make music, but I don't know how to use any modern programs. I tried to learn Ableton, but it was a bit difficult, so I thought I would just make my own tool," he says. "The VR market is small enough that I thought I should broaden my appeal a bit. So as I developed and iterated, the product morphed from just synthesizer to a nascent 'GarageBand for VR' - it's not there yet, but with every update it's inches closer." Olson believes that his solution is a major attraction for music professionals and hobbyists because it offers all the tools they need to experiment with new sounds. "It would probably be the user interface design. Beyond being a set of audio tools, for me, SoundStage is a user interface sandbox. It is a place where I can play with new ideas about how we can interact with objects and abstract ideas," he says. The potential of virtual reality also extends to the realm of art and design. There are now VR-ready apps that can help you create your own masterpieces without having to get messy or buy physical tools. Google's Tilt Brush is still one of the best examples. The tool, available through Steam, allows you to paint in 3D space using a VR headset. Using the simulator, you can create your own paintings within a virtual studio. Again, it's been designed to work with the HTC Vive, primarily because the headset comes with a hand controller. This acts as a brush and a palette while you create your own pieces of art. There are a selection of brushes, colours and other tools to choose from. 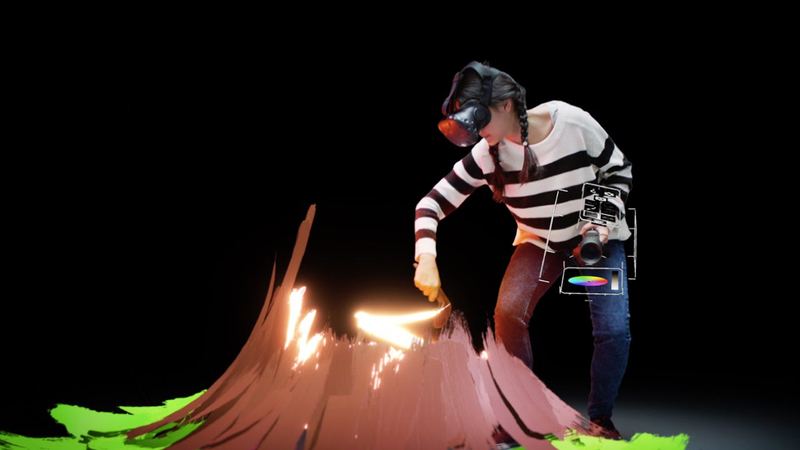 Luciana Se, a VR evangelist who is working on the upcoming AVR incubator and centre in London, says the creative potential of VR is endless and believes that apps like Tilt Brush are revolutionary. "There is so much to say about linking creativity and VR, as it forms the pillar of what immersive reality is about: building, creating and exploring new worlds. Immersive storytelling is incredibly powerful," she says. "Tilt Brush is one of the most extraordinary apps out there today. It's a simple concept, basically transposing a modeling and painting software to 3D. But I think experiences that allow people to change their environment and create for others will ultimately be the most enduring experiences. You can create art pieces with full-room scale VR. Essentially drawing/painting/sculpting are all rolled out to you. It's mind-blowing." Toronto-based technology firm Yulio, founded in 2015, has developed a platform that allows architects and interior designers to edit, publish and share projects easily through the medium of VR. It also helps clients to visualise the plans for the space, something that is easier for the architects themselves, and can speed up the collaboration stage by 50%. Robert Kendal, Yulio's CEO, says the power of VR is creating a revolution in the creative space and is giving designers a unique opportunity to improve their work. "VR is a medium that enables, like never before, creatives in the architectural and interior design space to explore their designs in what feels like a living breathing environment," he tells Wareable. "Designers are able to do design iterations very quickly, share ideas to get feedback from friends, colleagues or mentors from wherever in the world they happen to be. VR also enables those looking at new building and interior designs, possibly overseas property buyers, to 'experience' an unbuilt or remote space virtually in a way that gives a true sense of its scale and style." Developing VR hardware is a competitive task, considering the amount of products that have been launched by industry leaders such as Oculus, HTC and Sony. This wasn't a concern for 3Glasses, though. The firm has designed a VR headset that puts creativity first. While you can use it to immerse yourself in virtual worlds, there's a big emphasis on using it to create your own experiences. It's supplied with software kits for game and application development. 3Glasses is currently in the processing of developing its own VR development platform too. "As VR is a relatively new industry, creativity mostly refers to its potential adaption into different fields, this can be anything from gaming to medicine," Philip Kong, COO of 3Glasses, says. "To help foster creativity, headset manufacturers like 3Glasses focus on the enhancement of the technology and user experience. This gives developers and partners a strong foundation on which to create. "3Glasses is also developing an open source mobile operating system, input-output VR solutions, and a VR platform to encourage collaboration within the developer community to bring out the most creative side of the VR experience." Often, virtual reality is centred around entertainment. However, more and more it's proving to be a valuable tool for the creative process. As apps like SoundStage and Tilt Brush demonstrate, VR offers you a way to create essentially without repercussions. With that level of experimentation on offer, maybe the next da Vinci will create paintings made from VR.